I didn’t think she’d be awful, or embarrassing, but neither did I think she’d be quite so good. She looked great. She was relaxed, poised, confident, funny even. A funny, conservative, pro-gun, pro-life, creationist. How’s that for an oxymoron? Yesterday, I posted about how I’d be better for the job than she would. (you can read it, here. and please do!) And I still think she’s far from being ready to be President of the Untied States. But even though I disagreed with just about everything she said (other than the straight facts), I was impressed. And that’s why I’m scared. This is a woman who can make truly nasty personal remarks about her opponents, and make it sound charming. That is dangerous. Because who knows what else she can say and make it sound palatable. We should drill in national parkland? We should forgoe civil rights when it comes to foreign suspects? The possibilities are staggering…and awful. Speaking of awful…what’s with the nastiness? The two digs at community organizer? As Sybil Vane points out in her excellent post today, Dr. King was a community organizer. Guess his experience didn’t count for anything either. What’s really terrifying is that even though so much of what she said is patently untrue ( For instance, Obama’s tax plan raises taxes only for the richest 5% — oh wait! they’re all Republicans! ), the crowd ate it up. Evidently, if you’re a democrat, being a good public speaker means you’re devoid of ideas. But if you’re a Rebublican, nasty barbs, tasteless jokes (the poor maligned Pitt Bull! ), and egregious misstatement of facts – if said with a smile — add up to policy. And one more thing — just curious — does anyone know what “victory” in Iraq means? Seriously — tell me if you do. What you saw was Palin’s political prom-night … now watch & see what kind of hangover comes after it. Her own words will come back to haunt her – & they won’t seem nearly as “cute” or “charming” when she has to defend them. But it’s more likely she’ll have no defense because her handlers won’t let her anywhere near an impromptu event. The GOP will have to keep the bubble very tight indeed around this one – which negates her main utility as eye-candy. Go take a look at electoral-vote.com … they have Obama at 298 right now. A week ago they had him at 278. The only new events have been the conventions, & Palin’s choice as McCain’s VP. Sure, Sarah Palin may be cute, & she reads her script just dandy – but it looks like the GOP just tried to use an anvil as a life-raft. your analysis of last night is so on-point. in looking at the crowd, i saw red necks and rich conservatives, no in-betweens. and yes, i did see how the cameras played up the ethnic minorities in the crowds. I also agree that she was most ungracious about obama and biden, given that obama earned his position by votes, after working long years as a community organizer (did you see her disdain?!!!) and she was just selected as a pawn in mccain’s game. but, as jim above said, we’ll see how she deals with the vp debate and how she deals with ad lib sessions with the media. I agree. If you’re feeling adventurous, you can check out what I had to say at http://nouvelleblogger.blogspot.com/2008/09/palin-teen-pregnancy-and-constitution.html. I love your writing–I’m subscribing, baby! 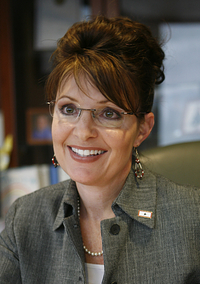 I appreciate your pointing out the meanness of Palin’s attacks–and she is getting meaner. Given that she has a history of taking down people who disagree with her, this is not a surprise, but the pre-adolescent nature of this approach makes me sick. I sense that the people who love her, and hate “elitism,” are stuck in a sort of permanent junior highschool limbo.